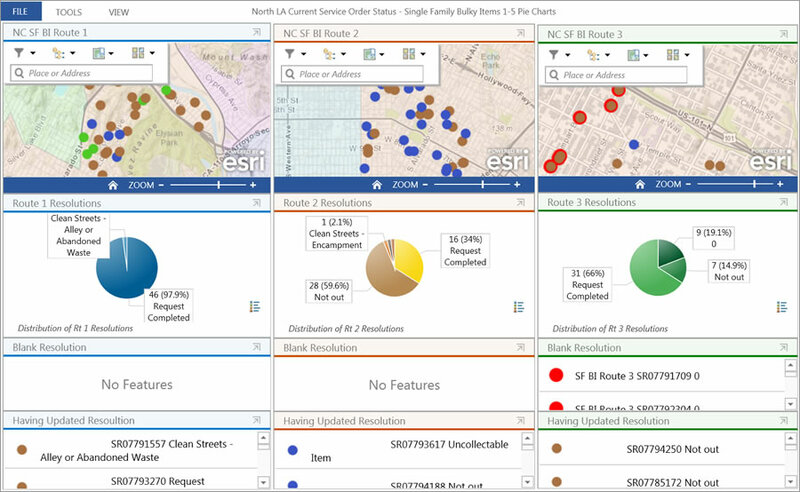 Operations Dashboard for ArcGIS shows the real-time status of calls by type-of-service resolutions. 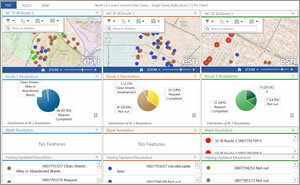 To better manage, monitor, maintain, and route its large fleets, the City of Los Angeles Bureau of Sanitation Solid Resources Collection Division (SRCD) has thoroughly integrated Esri cloud and mobile technology into its fleet management workflow. Using Esri Directions and Routing Services available in ArcGIS Online, apps such as Collector for ArcGIS, and other Esri technology, SRCD is now saving time and conserving fuel by increasing its fleet routing accuracy. With a fleet of trucks responsible for picking up everything from yard trimmings, recyclables, and broken large appliances in Los Angeles and a number of other surrounding communities, that's a major accomplishment. In 2004, SRCD had a good routing and fleet-tracking system. It used Motorola personal digital assistants (PDAs) loaded with Esri ArcPad and Esri ArcLogistics routing software. That combination worked well for years—until PDAs went into steep decline and Esri phased out ArcLogistics. With stylus-operated devices falling out of favor—and without any technology ready to succeed them—SRCD had no choice but to use Thomas Guides to route its drivers. Sal Aguilar, environmental engineering associate at SRCD, along with other members of the division's GIS staff, knew there was a product to extend ArcGIS, the office's enterprise mapping software, to digitally route the fleet again and do much more. That missing piece would finally let them trash their Thomas Guides or, better yet, recycle them. With no red dots remaining, the dashboard shows that all stops have been made for bulky item service on routes 1 and 2. Pickup of bulky items still need to be completed on route 3. ArcGIS Online, Esri's cloud GIS, was just what Aguilar needed. By 2011, ArcGIS had grown into a true platform by tightly integrating with ArcGIS Online for real-time access anywhere and by making optimal use of organizations' existing spatial data infrastructures. 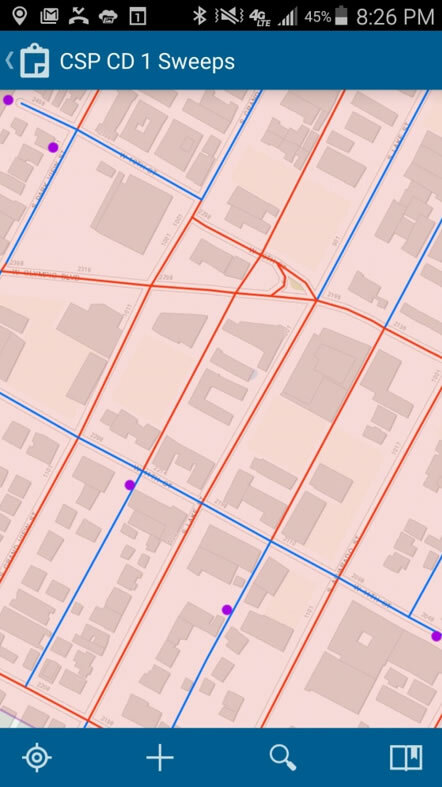 Although the real-time mobile routing capability in ArcGIS Online was the answer for the bureau's route sequencing needs, endemic bureaucracy in the city threatened to delay approval of an efficiency upgrade. The 2012 Los Angeles mayoral election changed all that. After having run on the promise of a more efficient government and winning the election, new mayor Eric Garcetti created a sweeping initiative to update technology where it was needed throughout the city. Aguilar's plan to extend ArcGIS now had full support and by 2013, the SRCD had once again integrated mobile routing into its fleet management practices. SRCD collects bulky items such as furniture and white goods (refrigerators, washing machines, and other appliances) by request. More than 60 drivers deliver these services, all by appointment. Aguilar uses ArcGIS to pull out the requests. "Those service orders go from our call center into the Oracle database," says Aguilar. "We needed to be able to map the orders in real time and automatically generate optimized routes to our drivers." The service orders are used within a Route Planner application that was configured by GIS specialist Maria Maldonado. Route Planner uses ArcGIS Online Directions and Routing Services to build the routes, which are then shared as a web service for consumption in Collector for ArcGIS, Esri's field data collection app. 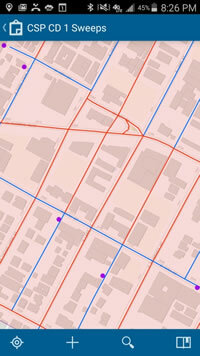 In this map in the Collector for ArcGIS app, the streets in blue have been inspected for abandoned waste while the streets in red remain to be inspected. "The web service allows the drivers to find their route map in Collector and then enter the field data they need to collect, such as service resolution, items collected, and quantities," says Aguilar. "Pushing that web service directly to the drivers' phones ensures all the stops are current and updated, adjusting the routes as necessary." 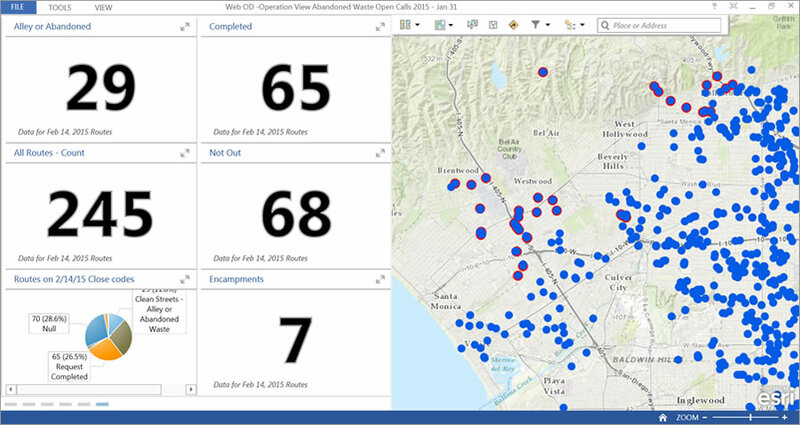 Back at the office, management can view status of work completeness on Operations Dashboard for ArcGIS. In today's fiscal climate, it's never been more important to build on and extend the existing mapping resources that offices such as SRCD already have. Most public works departments run core ArcGIS for enterprise mapping, so they have a solid base to extend the system into a platform. Los Angeles's elimination of IT roadblocks proves that it only takes a few small pieces to transform foundational GIS into a route-and maintenance-automating powerhouse, vastly improving fleet operations and saving time and money. Esri technology also is being used to track and schedule maintenance on the SRCD's fleet. Stop-and-go vehicles such as sanitation trucks incur vehicle wear and tear. To improve the monitoring and scheduling of vehicle maintenance, the SRCD implemented a pilot program to upload inspection and maintenance information to Zonar Systems. Zonar provides an electronic vehicle inspection report and automated vehicle location (AVL) system that automates GPS events (e.g., container lifts, truck weights), capturing and verifying the inspection process to ensure compliance with state and federal law. 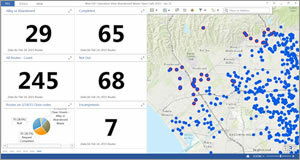 Esri complements Zonar fleet data by displaying fleet location and other data specific to operations in maps fed with data processed by ArcGIS GeoEvent Extension for Server. The integration of inspection data into the bureau's GIS allows staff to automate curbside route generation and provide a real-time ETA for service calls. "Zonar provides many vehicle parameters, such as GPS location, speed, odometer, and truck fault codes," says Aguilar. "With a fleet this big, we need fine-grained telematics information to keep our fleet working at a high level."